Is It Acceptable to Have Ponding On My Flat Roof? There is a lot of speculation with older building designs and how their flat roofs have a tendency to collect pools of standing water referred to as ponding. The purpose of this report is to provide clarity for a commonly misunderstood notion that a flat roof, whether it’s asphaltic built-up, modified bitumen, or any kind of single-ply membrane, should not bear any kind of collection of rain water. I will provide brief examples from the IBC, U.S. Department of Housing and Urban Development, and Factory Mutual, all of whom mandate construction and renovation standards to comply with regional climates,weather patterns, and safety. Ponding water, as described by the IBC and recognized by the U.S. Department of Housing and Urban Development, is water that remains on a roof surface longer than 48 hours after the termination of the most recent rain event. An older building will lack modern specifications for framing slopes a minimum of 1/4” rise per 12” run. The solution to controlling water flow on a dead flat roof, if ponding is still a noticeable concern after following the aforementioned provisions, is designing a framed slope for positive drainage to scuppers and/or bowl drains. Along the same lines,, I have a flat roof that has some standing water and have put on emulsified asphalt and seem to stop it but it keeps coming back after a few months. It’s a torch down bithumen roof. 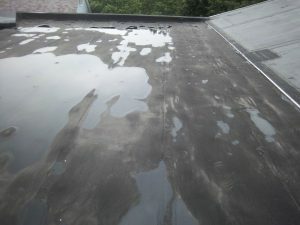 Good work on the roof repair articles! Thanks for the information! The building that my business rents has a flat roof, so there’s a lot of ponding that happens after storms. We haven’t had any leaks after working in this building for a couple of years, but I’m still worried that it may become a problem for us later. It’s good to know that there are some flat roofs that are made with drainage in case ponding occurs. I should still check to see if our roof is equipped with proper drainage so that any ponding in the future won’t become an issue for us. A recent development in combating ponding water is the use of liquid silicone. Since it is not an organic product it is impervious to ponding water and sun. Think of it like a roller applied pond liner. If you look on line there are a number of manufacturers that offer silicone. It is a good solution to safely resolve ponding issues and the product last for a very, very long time.